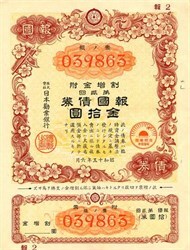 This was first issued in 1940 and is was for 5 Yen. This series paid no interest and the holder could only hope to receive one of the premiums from the patridic drawings. After ten years of drawings, the principal would be paid on the bonds that had not been drawn. This series has a "China Incident" seal of an airplane and rising sun.